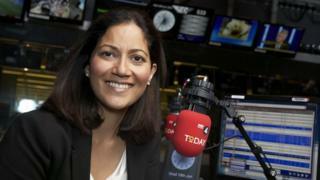 Mishal Husain, who hosts BBC Radio 4's Today programme and television news bulletins, has won broadcaster of the year at the London Press Club Awards. Husain was nominated alongside two BBC colleagues - global health reporter Tulip Mazumdar and social affairs correspondent Alison Holt - as well as Matt Frei from Channel 4 News. BBC director of news James Harding said all three honours were "much deserved". The London Press Club hands out the accolades every year, primarily to print journalists. Husain was the winner of the evening's only broadcast award. She joined Today in 2013 after 15 years with BBC World News. She has also presented the BBC's News at Ten, Newsnight and Breakfast, and was part of the BBC's Olympics team in 2012. Husain has reported from locations around the world including Pakistan following the deaths of Osama bin Laden and Benazir Bhutto, Cairo during the Egyptian revolution and China during the 2008 Beijing Olympics. "It's wonderful and much deserved," said the BBC's Harding of Husain's honour and the other BBC nominations. Judges said the Daily Mirror beat the Daily Mail and The Times to win daily newspaper of the year for "regaining its passion and authority" with "a series of important scoops and vigorous campaigns". The Mail on Sunday kept hold of its Sunday newspaper of the year crown, beating The Independent on Sunday and The Sunday Times. The Sunday Times insight team won scoop of the year for its Fifa expose, while The Sun's Ally Ross won reviewer of the year. Lord Lloyd-Webber was handed the Londoner of the year award in recognition of his outstanding contribution to West End theatre. See the London Press Club website for all the winners.